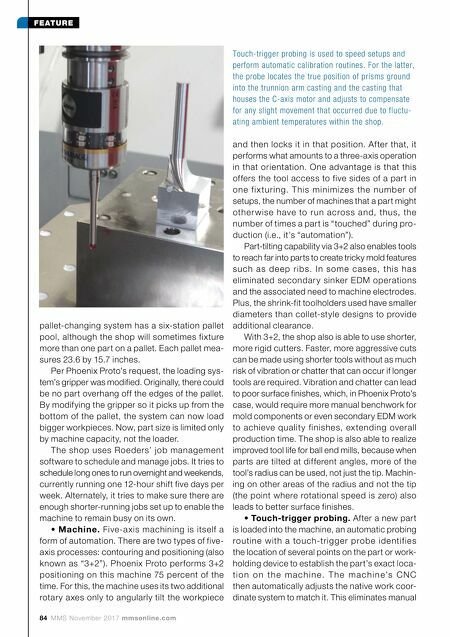 mmsonline.com November 2017 MMS 85 FEATURE shimming, part nudging and other time-consum- ing duties that would otherwise be required to get the part leveled and aligned to perfectly match the machine's coordinate system. • Automatic calibration cycle. The five- a xis machine has various cooling channels in its base, rails, carriages and so on, so those components won't expand due to internal sources of heat. However, to adapt to fluctuations in ambi- ent temperature inside a shop (say from the beginning of a day to the day's end), an automatic calibration cycle using the touch-trigger probe can be performed. The Roeders calibration cycle is carried out differently from most other machine tool builders' processes, Mr. Byers explains. He says those cycles typically call for the pallet currently loaded into the machine to be removed and replaced with another pallet having a tooling ball. This ball is then probed to determine how much of a shift in its location has occurred due to changes in a mbie nt s hop te mp e rature. C onve r se l y, the Roeders cycle doesn't require the existing pallet with workpiece to be removed. The machine has precision-ground prisms on its trunnion-arm casting and C-axis-motor casting that are probed to determine any position changes and, if neces- sary, automatically compensate for those changes. Phoenix Proto performs this calibration routine o n c e p e r m o n th u n l e s s a n i s s u e i s n oti c e d and sometimes per forms it prior to a critical finishing pass. • Spindle growth compensation. Mr. Byers says some machine tool builders create algorithms for each machine prior to shipping to a customer to approximate how much its spindle will expand at different speeds and run times. However, he notes it is essentially impossible to account for all the various ways the customer might use the machine from one day to the next. Phoenix Proto's five-a xis machine has an optional automatic spindle-compensation system to adapt to spindle expansion (or contraction) in real time. The system uses a non-contact sensor attached to an L-shaped arm positioned near the spindle face (see the photo below). The sensor with nanometer resolu- tion detects how much the spindle expands or contracts during operation and feeds that infor- mation back to the CNC to adjust the Z axis up or down to compensate. This is especially impor- tant for five-axis operations, because when a part is tilted, spindle growth could affect the tooltip location in all three linear a xes, not just in Z. 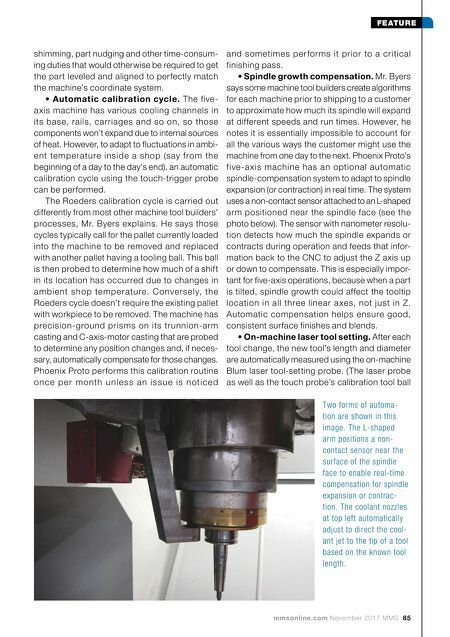 Automatic compensation helps ensure good, consistent surface finishes and blends. • On-machine laser tool setting. After each tool change, the new tool's length and diameter are automatically measured using the on-machine Blum laser tool-setting probe. (The laser probe as well as the touch probe's calibration tool ball Two forms of automa- tion are shown in this image. The L-shaped arm positions a non- contact sensor near the surface of the spindle face to enable real-time compensation for spindle expansion or contrac- tion. The coolant nozzles at top left automatically adjust to direct the cool- ant jet to the tip of a tool based on the known tool length.